SW end of house, looking N.
Friday, despite the cold and the Saxon dig at Patcham, 4 volunteers turned up to dig. We concentrated on the western half of the ‘lean-to’ extension to the south of the original cottage. 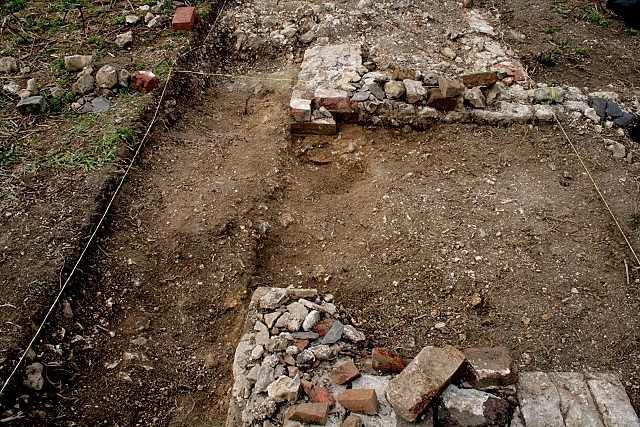 We have now excavated down through the demolition rubble, with its fragments of slate roof tile, uncovering more of the flint and brick walls (at least 3 types of brick), brick quoins on the corners, and parts of the mortar foundations (at least 2 types). Evidence of WW2 shell and mortar damage was uncovered by excavating a demolition rubble filled hole in the ground where a section of wall used to be. Finds included some short fragments of barbed wire (WW2? ), a tiny piece of v. thin window glass, fragments of salt glazed stoneware storage jar, and more blue and white pottery. Saturday, I attended Luke Barber’s excellent “Stone for Archaeologists” course. This gave me the opportunity to identify some of the stone found on the Newmarket Farm site. A coarse grained whetstone was identified as typical of 19th century stones manufactured in the north of England. An isolated small fragment of sandstone was from the ‘Hastings Beds’. Three large slabs of stone at the top of the mound of demolition rubble were of Purbeck limestone from Dorset, and another large slab was of a coarse grained granite. The roof slate (both purple and blue/green) was from North Wales. Luke Barber (who is an expert in post-medieval archaeology) told me that 19th c. sites such as these can be complex to dig, but that it is well worth doing. He has kindly offered to pay us a site visit sometime soon, and will hopefully give me some much wanted advice on how best to further this exciting dig. 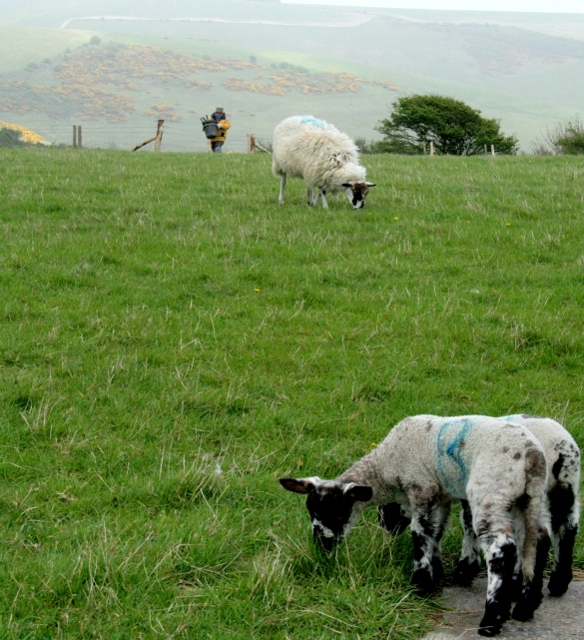 Hopefully the weather might get warm soon, though the new lambs on Newmarket Hill don’t seem to mind!